West Virginia, Ohio, Kentucky, and Tennessee. Prior to joining the Inland Waterways Division, he was sales manager/field repre- sentative for Derby Coal Com- pany, after previously working as a coal development representative for C&O Railway. XI guarantee to aid in refinancing the construction cost of the 96-pas- senger cruise vessel M/V America. The vessel has an overall length of 165 feet, molded beam of 36 feet, and is powered by a 900-bhp diesel engine. The America has operated be- tween ports along the inland and coastal waterways on the U.S. The Title XI guarantee covers $2,622,000, or 75 percent of the $3,775,966 cost of the vessel. Texas. This system compares the fuel burned versus the speed made for vessels in the 4,000-bhp range and up. It consists of two major components: flow and temperature sensing devices, and the main computer unit with the system display. Performance charts for the indi- vidual vessel may then be con- structed to allow operation at known efficiency levels. The sys- tem is configured to function with marine diesel engines using low- pressure fuel supply pumps and return fuel circuits. The FMS-3 has hardware and software correc- tion factors for fuel heating during recycling, aeration of the return fuel, and flowmeter calibration. Speed inputs to the FMS-3 come from either the vessel's on-board knot log or from the Pandel Chan- nel-Scan"' remote depth sounder. Display formats are readily changed in system software to meet any particular fleet require- ments. Several of these systems are now operating successfully on the Inland Waterways. 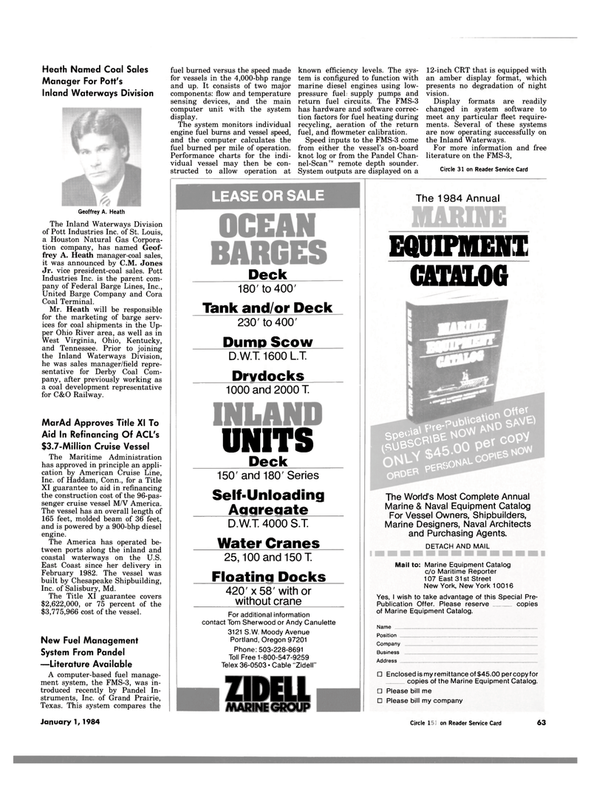 Prydocks 1000 and 2000 T.
Water Cranes 25,100 and 150 T.
Telex 36-0503 • Cable "Zidell"
Publication Offer. Please reserve ___ copies of Marine Equipment Catalog.